The Departments of Politics and History of the SIES College of Arts Science and Commerce a leading institution in Mumbai organised a successful film festival on ‘Nehruvian Ideology and the Indian Celluloid’ on 23 and 24 January 2015 to commemorate the 125th birth anniversary of India’s first Prime Minister, Pandit Jawaharlal Nehru. The festival was received with great enthusiasm by students and professors from other leading City Colleges like as Ruia, Mithibai, Vaze, Sathaye, Khalsa, and Kirti Colleges. The Film Festival’s aim was to highlight the Nehruvian era and his vision as for India during a significant period of Indian history. The movies screened during the festival – Awara, Naya Daur, Mother India, Pyaasa, Namak Haraam, Do Bigha Zamin, Manthan and Chak De India – reflected diverse aspects of Pandit Nehru’s ideology and the paradigm shift that took place in after freedom. Many mainstream filmmakers in the early years after India’s independence were impacted by the optimism of Nehru. Raj Kapoor’s ‘Awara’ and B. R. Chopra’s ‘Naya Daur’ were critical of the present but were extremely optimistic of the future. Pyaasa, a critique, shows the souring of the Nehruvian dream. It casts aspersions on the hopes and dreams that Nehru wanted. Guru Dutt attempted to express the industrialising society’s degenerative impact on the people and in this particular case, on free thinkers and artists. faced in integrating and unifying the country and shows how differences can be overcome through effective leadership which in turn will facilitate success. Nehru substituted the ideal of socialist society with the term socialist pattern of society which was described as a mixed economy with space for both the private and public sectors. 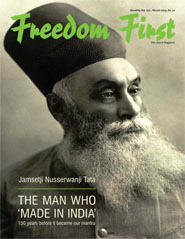 He wanted India to be self-reliant, not just self-sufficient. After the screenings on the second day, two panel discussions were held on ‘Nehruvian Socialism and its Impact on Indian Cinema’ and ‘Relevance of Nehruvian Ideology Today’. Medha Dhapre, Assistant Professor, Kirti College and Dr. Santhosh Pathare, General Secretary of Prabhat Chitra Mandal, adjudged the event. and student First Year BA (Political Science), SIES College of Arts and Science, Mumbai.